I do not need to want a long handle, as my hand wraps around the reel seat. But I want the balance just in front of the reel arm. 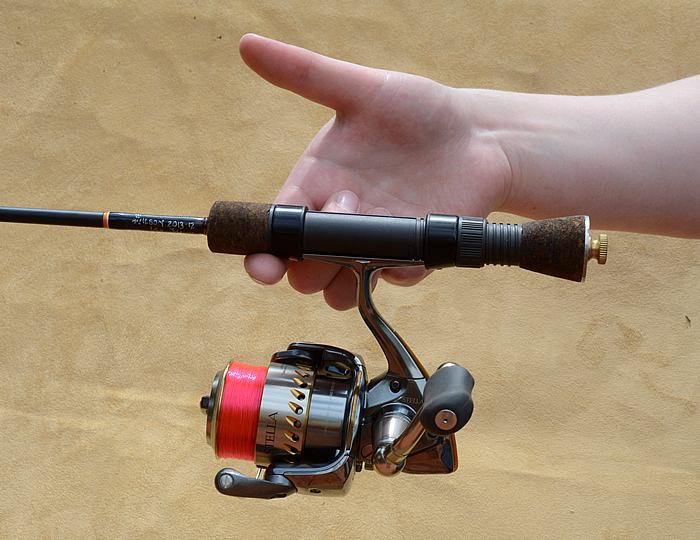 To move the balance point back, there is a 1/4″ brass thread rod in the back 6″ of the rod – extending under the reel seat, but protruding from the rear. Right now, I have a dummy washer and nut in place, but intend to add a brass block to tune the balance. Fuji Titanium Guides (Size 6) + Strippers and Reel Seat. The Fuji reel seat does not get a lot of love, as it is plastic, but it is a very good seat. Secure, warm and easy to hold. Silk being Black with Orange-White Trim Bands. Al’s CP + Prokote Epoxy. 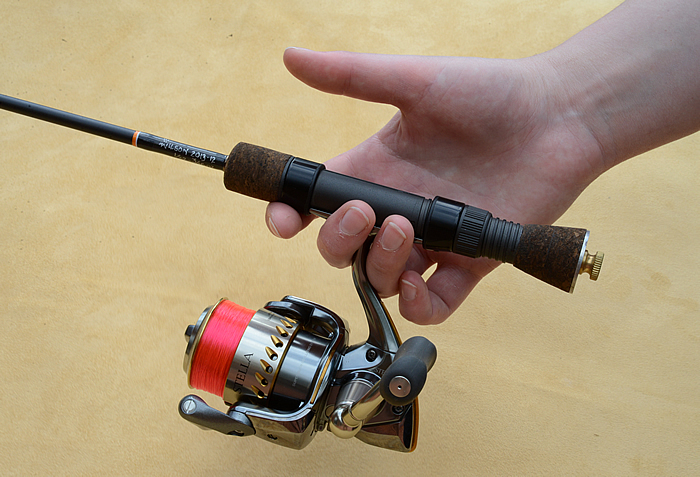 It was with this rod, I decided to make the dual band a signature on rods. Where I am being very conservative in weight, trim bands will be excluded. Decided not to wrap the tip-top. 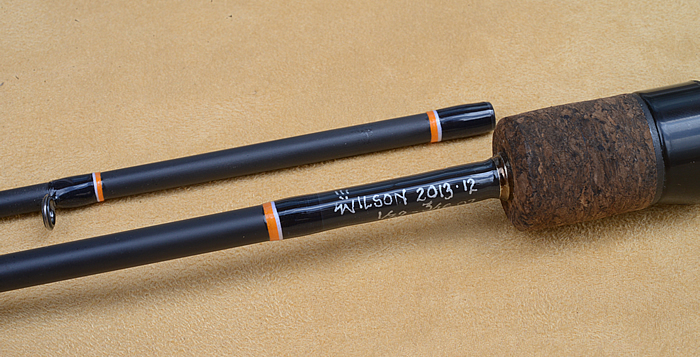 I am still of mixed opinion if wrapping the tip-top is of value, other than being cosmetic. What would I do different? 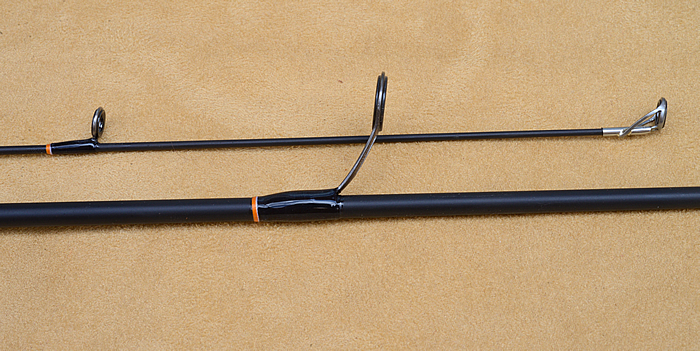 Look for a 2wt fiberglass rod and convert into a spinner using Recoil guides. Thank you for sharing your passion/hobbies. Your detailed analysis of wrap finishes is helping me with my own builds. Your UL is intriguing. I am currently redoing my own, used heavily 40 years ago and tapering off after finding it too light for Puget Sound pier fishing. Would fly wire guides after your couple reducing guides/choker keep the tip section lighter? Mine has only sentimental value, but I did consider the REC memory wires as very durable; the originals were all “remodeled” over the years. 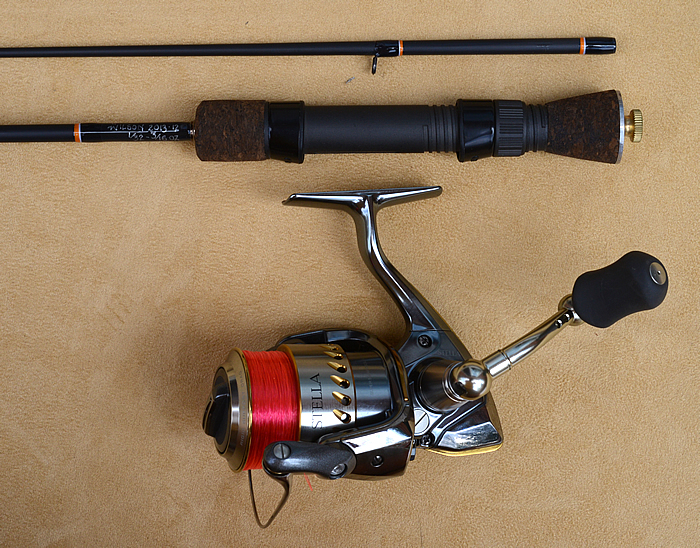 I am staying with my original Mitchell 300 reel, but it and yours must be too beefy for this size rod. I also find it funny that ultra light people are always switching blanks around. I am looking to transform a Bass Pro Microlite glass into a banty fly rod. Bruce, I am remote for another week, but thought I provide a quick answer. Yes, some do use and successfully a guide on the tip and I think using fine RECoil guides would be an excellent choice. As mono is finer, you can go smaller. Another smart choice for an Ultralight would be the raised single foot guides from H&H. I wish I still had my old French made 300, but I do have my old 308. Oh yes, with what I know today, I would have selected one of the 2 aforementioned single foot fly guides for this build. Also do a web search for Kabuto fiberglass, these would make an excellent conversion to an UL. Kabuto does small builds once a quarter and these are on the fast side for fiberglass.